I am enjoying a Sunday morning with my husband and I happened to stumble along an article about buying organic produce and thought I would share with you. It is not the best article or information on the subject, but it is worth reading. I am happy to share some better books and resources if this is something you are interested in. As most of you know I have been eating organic for about 13 years now. Yes, since I was a teenager. People ask me why we eat organic and how we afford it. It seems like a no brainer to me. My health and the health of my husband is way more important to me than our bank account. I had to learn how to "afford" it and how to make it work, but let me give you hope that it is doable. The article was only about produce, but as you read along I also want you to think about your meat and grains being organic as well. A good rule to follow when you are starting to eat and buy organic produce is to ask yourself..."do my fruits and veggies wear clothing?" Let me explain. Peaches, strawberries, apples, pears, peppers, carrots, lettuce are all "naked." I mean they don't have a coat to protect them from the tons of pesticides that are poured on them when they are growing. So when you are trying to make this work for your household start small and don't get overwhelmed. 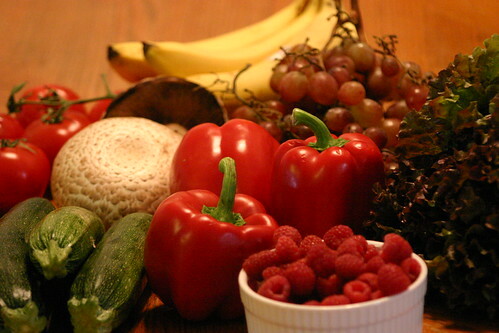 These would be fruits and veggies you would for sure want to buy organic. I buy a lot of my fruit in the frozen food section and thaw them in the fridge and they are yummy. My favorite is blueberries. Frozen fruits and veggies have about the same nutritional value as fresh fruit and can be cheaper and they are yummy in smoothies! It is good to buy frozen when a certain fruit you may want is not in season. Generally fruit is frozen in the height of their season so they are the sweetest and yummiest. There are some others that are a bit more protected because they do wear some clothing. Pineapple, mangoes, watermelon, onions, avocados have a bit of a coat to them so they are a bit safer from the heavy residue of pesticides. This does not mean they don't have any pesticide residue, but just that their flesh is protected a bit more. Here are some of the things people say to me about buying organic.
" The amount of residue on the fruit and veggie is so small there is no way that it could cause a health concern." This frustrates me the most. Would you feed you family or yourself a little side of rat poison or chemical pesticide with every meal. I mean not enough to kill you or cause a disease after that one dose, but just a little everyday? What is the big deal, it won't kill you or cause an immediate problem? Ahhhh!!! I just don't get it. A little bit of something put into the body every day will eventually cause a big problem. It's just not worth it. "I would rather have the pesticide than have a worm hole in my food, gross." I don't know any real statistics on this, but I am pretty sure I have not heard of a case that worm poo killed a person or caused cancer. That is all I can say about that. I would love for some of you to check your area and see if there are local organic farmers around. Do some research and see why you would want to start eating organic. Do you care about the earth and where your food comes from and supporting the local farmers that are trying to keep our soil the way God intended it to be? Do you want your children to be free of all those chemicals? Do you want to protect you own body and prevent illness and cancers in your body? What we put in our bodies is so important for our health, our health now and our long term health. Before you eat, ask yourself where you think this item came from or how it was produced. I am pretty sure if you become conscience about this you will change your eating habits quickly. Be careful not to become overwhelmed by all of this, it can be fun and it will be a life saver for you and your family and not to mention organic food taste way better than chemical laden food. I will receive our first basket of organic produce from Kretschmann Farm on June 4. This will be the first year we get our produce from a farmer. I will let you know how it goes. Do your research. I am happy to help in anyway I can. P.S. Thanks for the image pwinn .